I finished 19th of 108 shooter in Production at 79% of the winner, Team CZ Shooter Robin Sebo. Chris K finished 43rd of 108 in Production at 60% of the winner. Competing and traveling with us was TD Roe who finished 9th of 23 shooters in Single Stack at 60% of the winner, Team CZ-USA Captain Angus Hobdell. If you just want to see some cool footage, watch below... If you want to read the recap/summary, find it under the vid. I shot the 2011 Florida Open: My wife and I drove down the Thursday before the match and arrived to Sarasota exceedingly late, around midnight. The trip from Sarasota, and the free lodging it brings, into the interior is about ~2 hours, so waking up at 4 AM to get to a 7AM start compounded the folly. Add to that complex stages, and I'm surprised that I did as well as I did last year (60% or the winner). This was clearly the wrong way to plan it again this year, so if you've been following our progress, we had our plans to fly in on Wednesday night in order to mind our gear, get some rest and walk the stages. Other than almost getting bumped off the flight (it was overbooked), flying with our gear was no real problem. Just plan to arrive ahead of time and let them know that you have an unloaded firearm to check. This year's stages were no different: They were fun to shoot, fun to look at (the theme this year was the American Holidays: Thanksgiving, Halloween, Flag Day, etc...) and since we had the luxury of a day to walk the stages, amenable to planning. I took notes in my graph-paper equipped Moleskin note book, which is small enough to toss into my range bag. 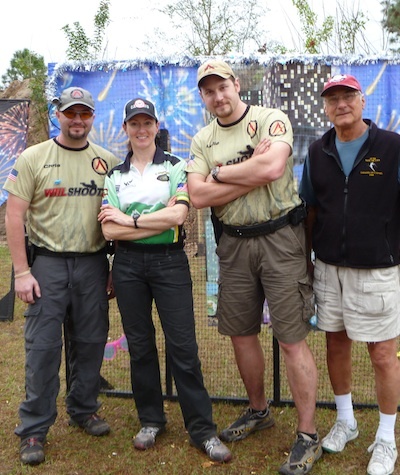 We were squadded up with some familiar faces: Jerry G & Ken R. of McHenry IPSC. TD knew them, so that was a plus. Additionally, we had two lawyers from Columbia (One a NWU Grad! My alma mater! ), and a few guys from the Aruba IPSC Team. We had no open shooters, which made for a headache free day! TD, Chris and I have shot together in the past, so we were comfortable cheering each other on, taking videos, and talking over stage plans. Chris forgot his match notebook and it was handy that we were able to confer together on many of the stages - truly the value of good teamwork/the buddy system. Overall, I finished the day strong in 8th place - as weekend scores dropped in, my lead would diminish and I ended up at 19th place. Last year, Team Ecuador Production Shooter Galo Moriera's name stood out, and I was able to compare myself to him this year again - he was at 95% of the winner and I was at 79%, which is a 16% difference. Last year, he was ~95% and I was at 60%, which means that I must be doing something right to close the gap on a shooter of his skill level! In reviewing the video, I cringe, noticing all that I could've done better: I've walked away with a veritable laundry list of things to examine that should help me kick it up a notch. Overall, I feel that I ran a consistent match, performing to a very high degree, but know that there is much room for improvement. I shot the match at 89% of the points possible, but am still performing too slow: 333 seconds overall, when the top 5 are running ~260 - 270s on average. This all isn't an unknown to me. It is something that will have to change slowly over time and through solid practice. Part of my analysis will be to cross examine the leaders times, hits, etc across all divisions to try to glean some insights. I think Chris' performance, a solid 60%, speaks much of just how far it is possible to go in one freaking year! This was no "club match" - this was the real McCoy! TD shot very consistently through the match. Well, until next year, I'll be training hard!